The Yorkshire Dales is widely recognised as an important habitat for maintaining and raising the population of red squirrels. Wildlife artist Stacey Moore has made it her mission to support and raise awareness of the struggling squirrel situation through her artwork. The work of the Yorkshire Dales National Park Authority, staff and volunteers, includes monitoring red squirrels and they have set up the Snaizeholme red squirrel trail and viewing area in Widdale. This has become a thriving reserve for the red squirrels as well as giving visitors the chance of a close encounter with these delightful little creatures. Stacey’s new coloured pencil drawing is titled, ‘Yorkshire’s Redheaded Wonder’, featuring a red squirrel from Snaizeholme on a Yorkshire dry stone wall. 10% of the Original Drawing and 10% of every Limited Edition Print sale will be donated to the National Park Authority’s funds for red squirrel conservation. Yorkshire Dales National Park Authority Wildlife Conservation Officer, Ian Court, said: “We would like to thank Stacey for her generous offer that will help with the Red Squirrel conservation and raising awareness work that is undertaken by the Authority. Stacey is clearly passionate about these animals and has spent a lot of time observing them in the woodlands around Hawes, enabling her to capture the true character of a Yorkshire Dales Red Squirrel as it bounds along the top of a dry stone wall that is so expertly portrayed in this excellent print”. Limited Edition Prints available in four different options below. 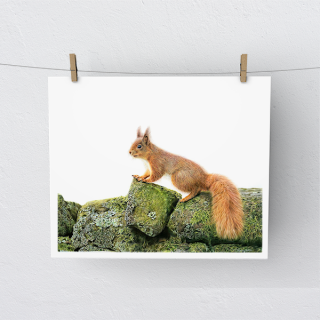 Wildlife artist Stacey Moore has donated a significant sum to red squirrel conservation efforts in the Yorkshire Dales National Park – following strong sales of her print, “Yorkshire’s Redheaded Wonder”. Stacey created the coloured pencil drawing last autumn and promised to donate 10 per cent the sales profits. With the “Wonder” flying off the walls at her studio and shop on Main Street in Hawes, she has been able to give over £500. Stacey Moore said: “It is so nice to have a positive contribution come from the creation of my artwork. I hope that the funds raised so far and in the future will help the red squirrel conservation effort for generations to come. " Yorkshire Dales National Park Authority Member Champion for the Natural Environment, Ian McPherson, said: “The ‘Wonder’ is a fine piece of work from a young, local artist and it is no surprise that it has done well. I’d like to thank Stacey for raising awareness of the spirit-lifting wildlife that we have in the Park – and not only that, for actively contributing towards conservation work. Red squirrels have a “vulnerable” conservation status in the UK. Thankfully, their populations in the Yorkshire Dales National Park are stable. The red squirrels in the Hawes area have spread naturally from Cumbria and have not been re-introduced. The Snaizeholme red squirrel viewing area lies in the heart of the Widdale Red Squirrel Reserve. See more details here. Mounted: Mounted 12" x 16"
Mounted: Framed 14" x 18"
Mounted: Mounted 16" x 20"
Mounted: Framed 18" x 22"